As one of the very few percussion soloists, Li Biao’s unique and in depth interpretation of percussion music bring significant rediscovery and fresh insight into the well-established percussion repertoire, making him one of the most outstanding percussion soloists in the world. 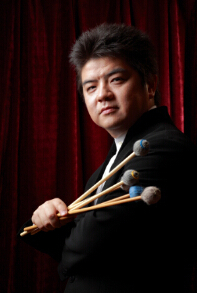 As a talented percussion soloist, Li Biao performs an extensive range of musical work. He gave a great number of solo recitals in various music festivals, cooperated with renowned orchestras and chamber ensembles including Bavarian Radio Symphony Orchestra, London Philharmonic Orchestra, Bamberg Symphoniker, Verona Opera, Czech Philharmonic Orchestra, Orchestra National de Lyon, Gulbenkian Orchestra, Philharmonie de Marseille, Franz List Chamber Orchestra, Janáček Philharmonic Orchestra, Hong Kong Philharmonic Orchestra, Singapore Chinese orchestra, NCPA Orchestra, China National Symphony Orchestra, China Philharmonic Orchestra, Beijing Symphony Orchestra, Shanghai Symphony Orchestra and many others. In 2018, Li Biao will be performing at the latest landmark concert hall, Elbphilharmonie. He will also be touring around Asia with Fabio Luisi and the Danish National Symphony Orchestra, after performing at DRKoncerthuset in Copenhagen. Season highlights also include Tainan Arts Festival in Taiwan, Masterclass series in Japan in August, the opening concert of the International Percussion Festival at China National Center for the Performing Arts, as well as touring with Li Biao Percussion Group in the coming summer. Li Biao has performed at the 2017 Belt and Road Forum Evening Gala at China National Center for the Performing Arts. Later that summer, he performed Guo Wenjing’s ‘Rite of the Mountains’ with the Gulbenkian Orchestra in Lisbon, wining a long-last standing ovation. Same year October, Li Biao Percussion Group brought their From East to West: Percussion Silk Road Tour back to China. In 2016, Li Biao was appointed Artistic Director of China National Center for the Performing Art’s International Percussion Festival. This marked the establishment of a new summer tradition for local audiences and has once again proven the infinite creativity and possibility of percussion music. 2015 marked the 10th anniversary of Li Biao Percussion Group. The ensemble toured around China in the fall and released its anniversary album ‘The Best of 10 Years: World of Percussion’ with Sony Music Entertainment. In 2014, Li Biao with his percussion ensemble came to South America, a historic concert tour with 12 great successful concerts in 6 countries. Li Biao’s performances within 2012-2013 include touring with Maestro Christoph Eschenbach and the NCPA Orchestra around China and Europe; performing with the London Philharmonic during the 2012 London Olympics; European and Asia Tour with the Li Biao Percussion Group; the 2012 Mercedes-Benz International Music Festival and the International Percussion Festival at the China National Centre for the Performance Arts, as well as many other famous music festivals in Europe. In 2010, Li Biao was invited as Music Director of the Mercedes-Benz International Music Festival and the International Percussion Festival at the China National Centre for the Performance Arts. In 2009, Li Biao delivered 22 concerts on a trans-era tour of eight European countries. He was awarded the “Men of Taste and Success 2009” by Men’s Bazaar. From 2008 to 2009, Li Biao led his percussion group to hold a series of concerts in 12 cities in China. In 2008, Li Biao and his percussion group were invited to perform at the closing ceremony of the 2008 Beijing Olympic Games and had received the “National Spirit Achiever Award” from Mercedes-Benz, AMG and City Magazine the same year. Li Biao is a frequent guest invited to perform percussion concerto at “Achtung Classic”– the most influential European classical music program and had recorded with renowned labels such as EMI and Teldec and Sony. He currently serves as professor at the Hochschule für Musik “Hanns-Eisler” Berlin and China Central Conservatory of Music. Since 2015, Li Biao became an exclusive artist of Sony Music.